In 2006, Dimitri Vasileiou decided to start running photography tours and workshops in Scotland. The main reason for this is his passion of sharing knowledge – he loves seeing potential talents bloom. As he says... "I love seeing people's faces when everything falls in place and they have a keeper in camera". Dimitri is a professional landscape photographer with an extreme passion in landscape and nature. He loves the feeling of being humbled by the beauty and majesty of locations and the quality of natural light as it touches every part of a scene, especially during the ‘Golden hours’. At present, Dimitri has extended the photo tours and workshops locations to other parts of Europe and even north America. 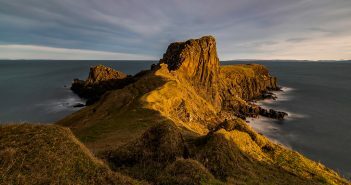 He is constantly visiting new locations to photograph for himself and, potentially, to include the best of them in his 'photo tours and workshops locations' list. We do not employ other photographers that we cannot have control of their acts on location. Our only tutors are Dimitri himself and his highly experienced, and extremely trustworthy friends Mike Bell and David Hay. Between them, they will share with you all you need to know for advancing your photography skills. Our photo tours and workshops are built upon a teaching and sharing platform, we always make sure you learn and advance. Our photo tours are based on holiday, relaxation and enjoyment. We will take you to well researched locations and will guide you on how to photograph them. If you have some experience already, we will do our best to inspire you and show you ways that will push your creativity to higher levels. For this, we make sure you stay in a comfortable accommodation, in the company of like minded people and in the relaxed teaching approach of Dimitri, Mike and David. After all, we do appreciate that this is also a holiday for you. We visit some of the best locations worldwide and to be more specific, the prime spots of these locations and during the best time of day and year for the ultimate light available. We aim to offer you a supreme experience of these landscapes and we always go the extra mile to make sure you leave the our photo tours and workshops with the most amazing memories, confidence and better photographic skills. Our experience, location research and organisation help us to achieve all this. Unlike others, we don't just take you to visit lovely places, anyone can do as such – we share the 'Ultimate Photography Tour and Workshop Experience' with you.